Quick and simple SEO audit of any web page. 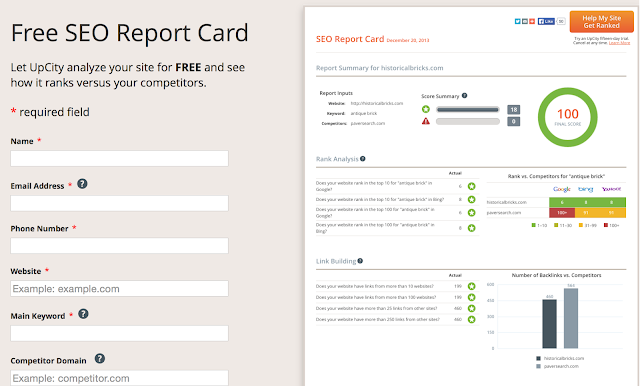 SEOptimer provides an easy to follow report of your website in seconds calling out what’s good and bad. SEOptimer can check their sites to tell you what they’re doing better and how can improve. White Label the best SEO Audit Tool on the Web. Embed an Audit Bar directly into your website. Get notified of leads straight to your inbox. There are many different elements that must work together to produce a truly effective and authoritative website. The elements covered in this report are critical for effective optimization, so let’s take a look at them in a little more detail. This is an extremely important (and often underrated) website ranking factor. Google wants to deliver the best results as quickly as possible. Your entire website – not just the homepage – should be optimized to load as fast as possible. It isn’t too hard to improve your page load speed, so stay on top of it. Your URLs need to be well-structured and uncomplicated or they could confuse the intent of your site for both search engines and users. This section of the report looks at the keywords used in the URL, how close the page is to the top-level domain, and other elements that make it more effective. Title Tags – A title tag will be the clickable link in the search engine results so it needs to be optimized for the keyword while giving a user a reason to click it. Meta Descriptions – While these are not a ranking factor, they are a conversion factor. The search engines will grab some text on their own if you don’t provide more effective options. Image Optimizations – An image is worth a thousand words, especially if you do everything you can to optimize it. Keywords aren’t what they used to be. Now, Google takes a more semantic approach to answering questions, and that means it considers “proof terms” or semantically relevant terms as well as the actual keywords. This part of the analysis looks at the words that get used the most on the page. Are they proof of your relevance? If not, it may be time for some more keyword research. You can use headers throughout your content to help users see what the page is about and, sometimes, use keywords to help search engines understand the page. You can use H1, H2, or H3 tags to properly format your page. Readability is just as important as keyword usage in your website copy. The copy you create impacts your rankings as well as the number of people who convert from casual visitor to paying customer. This will help you earn links, social shares, and search engine attention. Content marketing is key to your success. The code that powers your website may also be a serious speed bump for search engines and users if it’s not fully optimized. This part of the analysis looks at your HTML code, the use of Flash, schema markup, and other important elements. This analysis will look at the number of domain and page shares you are currently receiving. Social media is an important factor because it shows how your visitors are interacting and sharing your content. There are several good social strategies that can help encourage your users to do more. Recently, the number of Google searches on mobile devices officially surpassed searches on computers in the U.S. It’s important to make sure your website is mobile friendly to appeal to these users. Google also puts some extra value on websites that are mobile friendly. Links to your website and within your website can help Google understand the importance of various pages and help you build your rankings. This analysis looks at the number of links to and from your website (because linking to authoritative sites is also important). These links contribute to the authority and perceived trust of your website, which is expressed in various scores included in the analysis. There are a lot of factors tied to your domain name that could impact your rankings. The age of the domain, the length, and other elements are all examined in this part of the analysis. A good domain name it a foundational element on which you can build your online presence.